Why am I writing so many articles about #FakeNews at the Toronto Star and focusing on one article? Because the complaints sent to the publisher, public editor, and reporter about facts and the gross omission of facts were ignored. And this, for me, is at the heart of unethical journalism-the omission of facts; especially after those facts were provided. Why did the Toronto Star ignore Ayman Elkasrawy’s negative comments about Jews, Israel, Zionists and the Zionist lobby? Why didn’t the Toronto Star investigate Elkasrawy’s rush to “delete” his Facebook account as a suspicious behaviour? 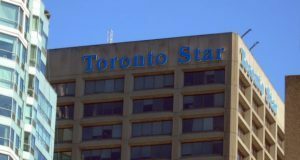 Is the Toronto Star hiding something? I contacted John Boytnon,Publisher, Bob Hepburn, Media Inquiries, Kathy English, public editor and Jennifer Yang, reporter many, many, many times. No answer. No explanation. Nothing. On October 22, 2017, the Toronto Star dedicated four pages, including its front page, in an attempt to exonerate Ayman Elkasrawy, an imam at “Masjid Toronto” mosque, from anti-Jewish and anti-infidel prayers during Ramadan 2016. It is filled with errors in fact and the gross omission of facts. I am enclosing some of Ayman Elkasrawy’s social media posts that directly or indirectly mention or deal with the Jews, Israel, Zionists and the Zionist lobby. You decide. Does he have something to hide? On April 2, 2013 Ayman Elkasrawy used the word the “Jew” in an allegedly derogatory context. In this tweet Elkasrawy mocked Egyptian television host Dr. Bassem Youssef by saying, among other things, that “the Jew is defending him.” Elkasrawy did not elaborate the identity of “the Jew”, but from the context it may refer to Israel or to Abdul Fattah Sissi, then the Chief Commander of the Egyptian Armed Forces and Minister of Defense. Within Egyptian Islamist circles Sissi is called in a derogatory context “the son of the Jewish woman”. 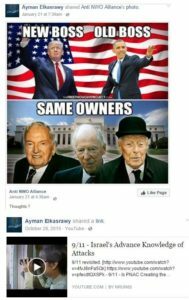 October 28, 2015 – Ayman Elkasrawy shared a link to a YouTube video entitled “9/11 – Israel’s Advance Knowledge of Attacks”. Elkasrawy “Liked” this video on his YouTube channel. This conspiracy theory video was later removed by YouTube. It is available here. December 13, 2016 – Ayman Elkasrawy shared Dar Al-Tawheed Islamic Centre’s photo featuring an ad inviting the public to attended a lecture by the “renowned scholar from Egypt” Shaykh Nash’at Ahmad. “The Lion of Palestine, the martyr Abdel Aziz Rantisi. Words that history will preserve forever. We will win, Allah willing” [originally in Arabic] – The almost 9 minute video clip features a compilation of some of some of the most fiery speeches by Abdel Aziz Al-Rantisi, co-founder of Hamas and later the supreme leader of Hamas (2004). In these speeches Rantisi vowed to continue the jihad against Israel, including by attacking Israeli cities and communities that at that time during the al-Aqsa Intifada were targeted by hundreds of Palestinian suicide bombers and attackers. So I asked the Star “Why didn’t the Toronto Star publish Ayman Elkasrawy’s social media posts and “Likes” on Facebook, Twitter and YouTube that directly or indirectly mention or deal with the Jews, Israel, Zionists and the Zionist lobby? Please explain why did you share and post the Facebook posts and tweets mentioned in the article? You stated: “I have nothing to hide”. Why did you change on August 6, 2018 the status of your tweets into “protected” which means that only your 40 (forty) followers can have access to read them? Why did you remove on August 6, 2018 all Likes from your YouTube Channel?